You can find more about all jobs and apply online here. The Natural History Museum is looking to recruit a Drupal Developer to work on the Scratchpads project (http://scratchpad.eu), which is based on the Drupal (http://drupal.org/) content management system. The role encompasses the development of content, theming and functionality for new and existing PHP and Drupal systems and applications. Scratchpads are a web-based informatics tools written using Drupal. They allow distributed groups of biodiversity scientists to create their own virtual research communities on the Web. The successful applicants should be able to work on their own initiative and be proficient in theming, coding, configuring and doing quality assurance on Drupal based websites. Mentored training and support will be provided. You will work with members of the developer and user community (research scientists, software developers and organisations) to manage and parse biodiversity data, in addition to helping with the design, construction and testing of Drupal modules and sites. The project includes opportunities for international travel to meetings, workshops, conferences and presentations as a member of the Scratchpad development team. A bachelor’s science degree (or equivalent) and previous experience in Drupal web development is also essential for this post. Previous experience in Drupal web development (version 6 and 7). We require evidence of Drupal websites that the candidate has developed. Experience with PHP, MySQL, Drupal, SQL, XML, HTML and CSS. The Natural History Museum is looking to recruit a Front End Developer to work on integration of the Museum collections digitisation projects. The role encompasses the design and development of the front end of a web application to interface with the Museum’s collections management system, KE-EMu, which will allow the quick and easy addition of multimedia and associated meta-data. KE-EMu is a collections management system designed specifically for natural history museums and other special collections. The successful applicants should be able to work on their own initiative and be proficient in producing beautifully designed and intuitive web applications. Mentored training and support will be provided. You will work with members of the developer and user community (research scientists, software developers and organisations) to identify the key software requirements. The project includes opportunities for international travel to meetings, workshops, conferences and presentations as a member of the Natural History Museum’s development team. This is a fixed term appointment for twelve months, but with the possibility of a contract extension. A bachelor’s science degree (or equivalent) and evidence of websites and web application components that you have developed are also essential for this post. Experience working with a front-end frameworks, such as Bootstrap, Cappuccino. The Natural History Museum is looking to recruit a PHP Developer to work on integration of the Museum collections digitisation projects. The role encompasses the development of a web application to interface with the museum’s collections management system, KE-Emu, which will allow the quick and easy addition of multimedia and associated meta-data. KE-Emu is a collections management system designed specifically for natural history museum and other special collections. It has a well-documented API that will enable the successful applicant to build and integrate a web application to support museum digitisation workflows. The successful applicants should be able to work on their own initiative and be proficient in producing well-documented and tested code. Mentored training and support will be provided. You will work with members of the developer and user community (research scientists, software developers and organisations) to identify the key software requirements. The project includes opportunities for international travel to meetings, workshops, conferences and presentations as a member of the Natural History Museum’s development team. Previous experience in Drupal web development (version 7) or extensive experience with an alternative PHP framework. We require evidence of websites and web application components that the candidate has developed. Experience of systems analysis and systems integration, interfacing with external services via APIs. Experience working with a front-end developer to produce fully featured intuitive web applications. It seems that we will be breaking free of the case study mentality and looking to build a generic system for biological citizen science.... follow our progress. The same talk a few days earlier at UCL. Previously I wrote about an Arduino based temperature and light sensor that could send it's reading to the web over Twitter. 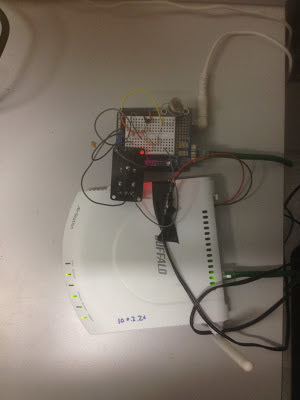 This made use of the Ethernet shield that is available for the Arduino. This post describes how to connect this wired Ethernet device to a wireless network using a wireless router. 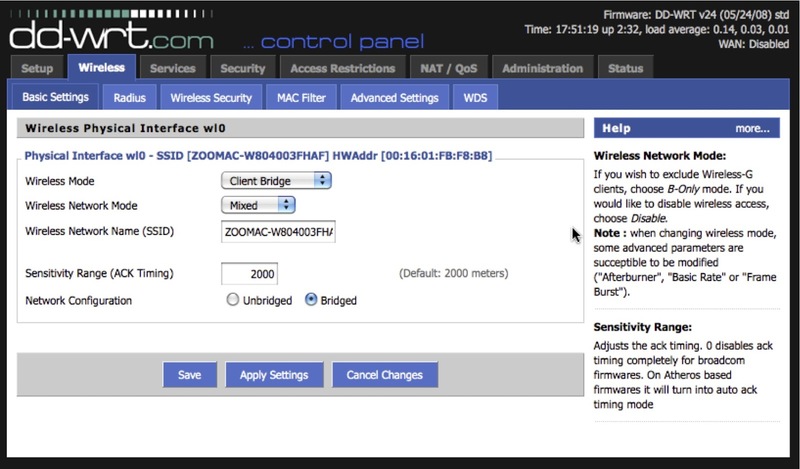 A WiFi Client Bridge allows a secondary wireless router to share a wireless network it receives via it's WiFi interface (from a primary wireless router) to devices attached to it via Ethernet. In this set-up the Ethernet connected devices behave as if they are directly attached to the primary wireless router. 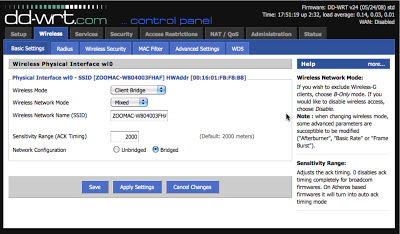 Most routers designed for home use are capable of acting as a client bridge, although the software inside the router (the firmware) often prevents you from using the device in this fashion. This problem can be overcome by replacing the firmware that ships with the router by one of several alternatives, I used DD-WRT for this project but OpenWRT and others have the same functionality. The individual router firmware project websites have lists of compatible routers (I got a second-hand Buffalo WHR-G125 from eBay for £6) and instructions for replacing (flashing) the firmware. Assuming that the primary router has a correctly configured DHCP server connecting Ethernet devices to the internet is as simple as plugging them into the secondary router. This is a useful way of placing Ethernet devices in places where running Ethernet cables would be awkward.